What is Rational Rhapsody Architect for Systems Engineers? IBM® Rational® Rhapsody® Architect for Systems Engineers is an integrated, systems engineering environment for analyzing project requirements. It uses Systems Modeling Language (SysML) and Unified Modeling Language (UML) to enable rapid requirements analysis and visual, model-based design. IBM Rational Rhapsody Architect for Systems Engineers helps your systems engineering teams design complex functionality in less time. 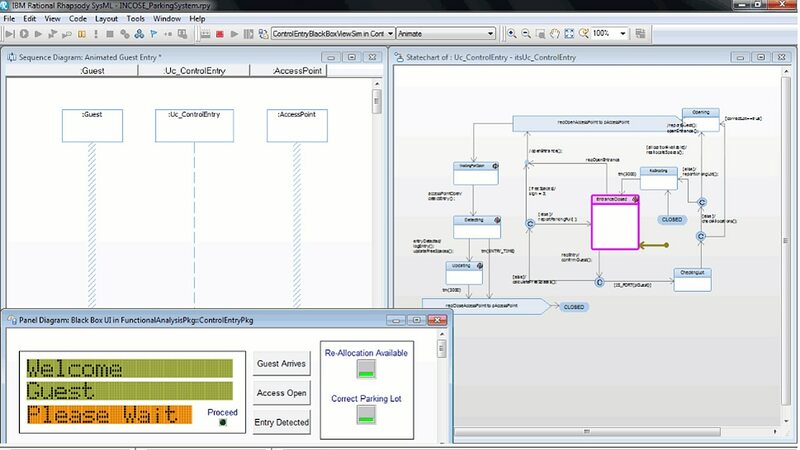 SysML and UML enable you to visualize complex requirements and maintain design consistency. Requirement traceability links requirements to design elements and test cases to help ensure coverage and assess impact of change. Team collaboration capabilities help manage the complexity of developing consistent designs across different environments. A low-cost system engineering environment that lets you analyze and elaborate requirements, make architecture trade-offs and document designs. All the capabilities of Architect for Systems Engineers, plus allows you to prototype, simulate and execute designs for early validation. A low-cost integrated software engineering environment to graphically architect C++, C or Java applications using UML or AUTOSAR. An embedded and real-time agile software engineering environment with full application generation for C++, C, Java and Ada (including MISRA-C and MISRA-C++).